Pain Lab researchers Tyler Fox and Carlos Castellanos, along with former lab researcher Steven Barnes and SIAT student Diego Maranan, will be presenting an exhibit and workshop at Gallery Gachet in Vancouver called Proof-of-Process. The exhibit takes place June 5-10 at the gallery, which is located in Gastown, 88 East Cordova Street. Proof-of-Process consists of a series of a hybrid exhibitions, workshops and symposia where participants, along with artists-researchers, can interact with and collaborate on, the development of science and technology-based artworks and research projects in various stages of development all within a publicly accessible laboratory and production workshop set-up in the gallery space. We seek to engender an atmosphere of critical engagement and experimentation where the experience of the work unfolds through its direct manipulation. Visitors are invited not only to view and interact with projects, they are also encouraged to directly manipulate components and actively change the configuration of systems. Unplug, rewire, and experiment. Pain lab researcher Terry Lavender led a workshop on using video games in the post-secondary classroom called First-Person Tutor. The workshop took place at SFUs Symposium on Teaching and Learning: Leading Change on May 17. 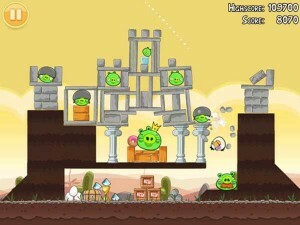 The workshop ended with a lively debate on how to use Grand Theft Auto in a Criminology course and Angry Birds in a Physics course. 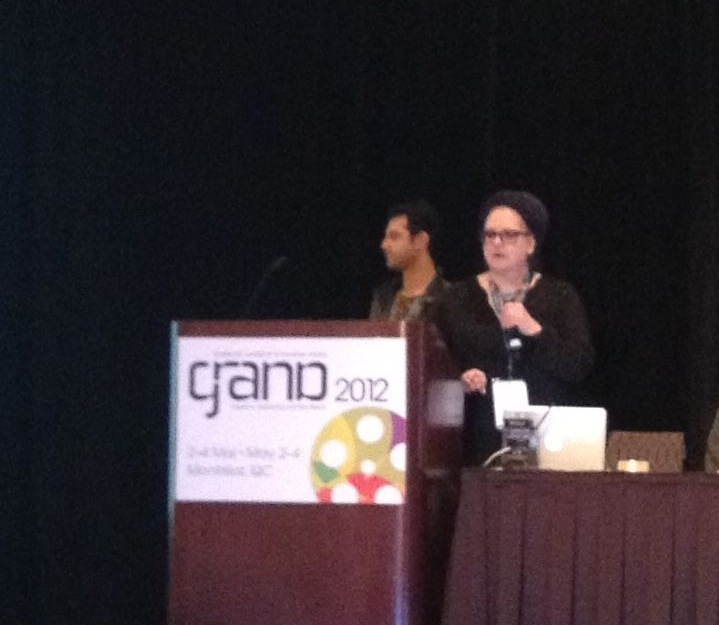 The presentation can be found here. 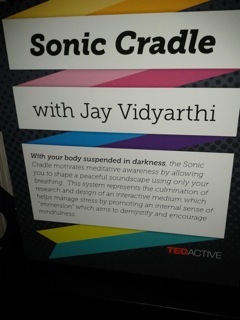 Jay Vidyarthi presented his Sonic Cradle meditative biofeedback system at TEDActive 2012, held in Palm Springs February 27-March 2. The annual conference aims to bring together innovative doers and thinkers to soak up remarkable ideas – and in a voice uniquely theirs, reflect them out to the world, according to the TEDActive website. For more information about the Sonic Cradle, click here. Sonic Cradle: Designing for an Immersive Experience of Meditation by Connecting Respiration to Music, by Jay Vidyarthi, Diane Gromala and Bernhard Riecke, has been awarded honourable mention at the ACM conference on Designing Interactive Systems 2012 conference, which takes place June 11-15 in Newcastle, UK. Heres the description of the Sonic Cradle in the conference program: Could an interactive system trigger the psychological benefits of meditation? We are pursuing an answer to this question through a systematic research through design approach which explores a psychological framework of media immersion. Our approach has generated Sonic Cradle: an interactive system aimed at combining sensory deprivation, respiratory biofeedback and music into a mediated experience of mindfulness. 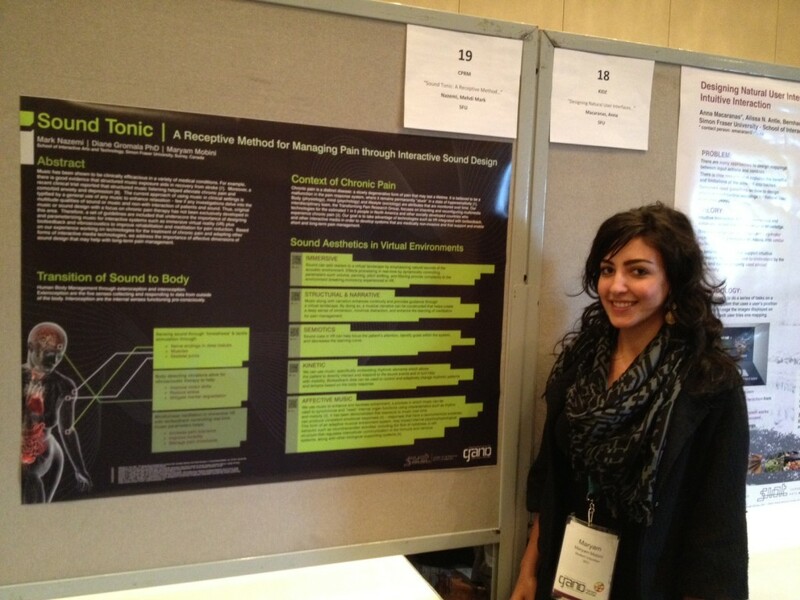 The Transforming Pain Research Group presented two papers and two posters at the annual GRAND NCE conference in Montreal, May 2-4, 2012. Jay Vidyarthi presented his paper on Encouraging Meditative Experiences through Respiratory-Musical Interaction, while Terry Lavender presented his paper on Impression Management Work: How Seniors With Chronic Pain Address Disruptions in Their Interactions, which was co-written with Alison Benjamin, Jeremy Birnholtz, Ron Baecker, Diane Gromala and Andrea Furlan. 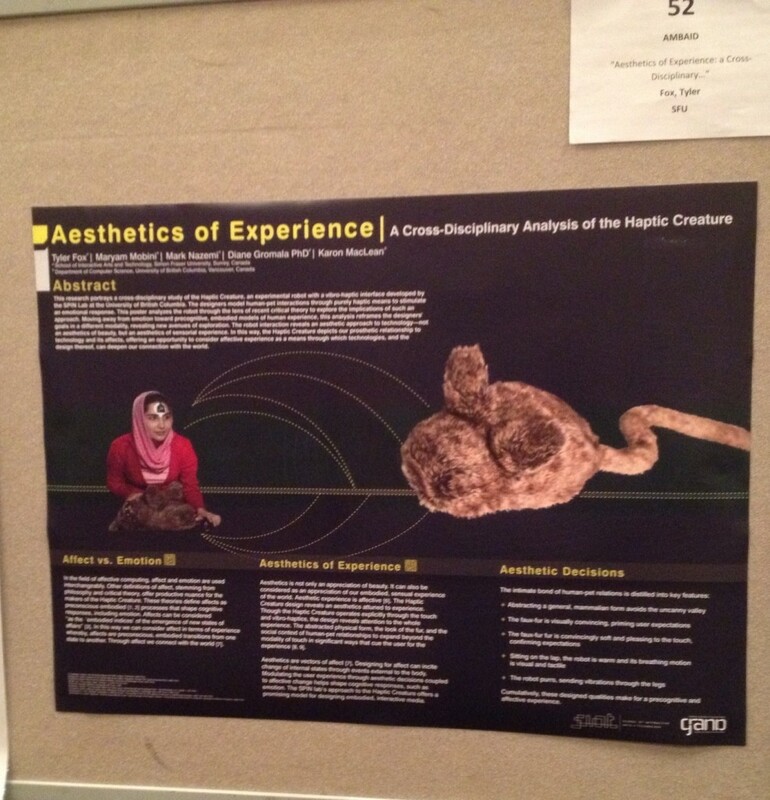 Two posters were also presented Sound Tonic: A Receptive Method for Managing Pain through Interactive Sound Design”, by Mark Nazemi, Diane Gromala and Maryam Mobini; and “Aesthetics of Experience: a Cross-Disciplinary Analysis of the Haptic Creature”, by Tyler Fox, Mark Nazemi, Diane Gromala and Karon MacLean. Nazemi and Gromala also participated in a conference mash-up on Anxiety, Pain, Ability, Strain: Technologies to mediate the mind/body at the conference.